Review posted November 21, 2014. Metropolitan Books (Henry Holt), 2014. 365 pages. 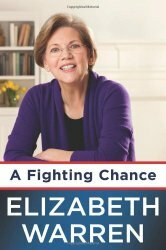 I checked out this book on a whim, knowing almost nothing about Elizabeth Warren; now having read her book, I am her total fan. She’s someone who’s gotten into politics not because she has a desire for personal power, but because she wants to help people. And I so respect that. My background is that my ex-husband and I started out our life together plummeting into debt. We dared to try to live in California and have one and a half jobs between us so that we didn’t have to put our son in day care. (He came along only a year after we got married.) When my husband enlisted in the military, it only made things worse. They told us what he’d be making after he joined the Air Force. They didn’t tell us it would be significantly less while he was in Basic Training, and we were still paying California rent, for another few thousand dollars of debt. And I still needed to find a job when we moved to New Jersey. All that is to say that I gained appreciation, years ago, for the fact that all people embroiled in credit card debt are not lazy freeloaders who want a hand-out. We were eventually able to pay off our debts – but then I got into a whole new pile of debt when my husband left me, and of course I lost my job since we had to leave Germany and then the divorce cost me thousands of dollars. This is not to grumble – I will eventually pay it off. But I can’t help but wonder how people in my situation cope if they don’t have my education level, and like me never thought they’d have to work full-time, and maybe have trouble finding a full-time job, and maybe have younger kids who need daycare. I just don’t have it in my heart to look down on people who find themselves in the position of filing for bankruptcy. So when I found out how Elizabeth Warren got started in what led to her political career, it was with a big cheer. Finally someone is saying what I have believed for years and years! As I dug deeper into my study of bankruptcy and the new law, I kept bumping into the same question over and over: Why were people going bankrupt? I couldn’t find solid answers anywhere. In those days, almost all young law professors specialized in theory. They wrote articles and books about the theory of this and the philosophy of that. But theory wouldn’t provide answers that anyone could count on, answers that would explain what had gone wrong. I clung to the idea that the people in bankruptcy were different and everyone else would be safe. I might not have said so at the time, but I think I was on the lookout for cheaters and deadbeats as a way to explain who was filing for bankruptcy. She did a study on bankruptcy and why it happens. She visited bankruptcy court in San Antonio and saw, not down and out deadbeats, but people who looked just like her and her students. As the data continued to come in, the story got scarier. San Antonio was no exception: all around the country, the overwhelming majority of people filing for bankruptcy were regular families who had hit hard times. Over time, we learned that nearly 90 percent were declaring bankruptcy for one of three reasons: a job loss, a medical problem, or a family breakup (typically divorce, sometimes the death of a husband or wife). By the time these families arrived in the bankruptcy court, they had pretty much run out of options. Dad had lost his job or Mom had gotten cancer, and they had been battling for financial survival for a year or longer. They had no savings, no pension plan, and no homes or cars that weren’t already smothered by mortgages. Many owed at least a full year’s income in credit card debt alone. They owed so much that even if they never bought another thing – even if Dad got his job back tomorrow and Mom had a miraculous recovery – the mountain of debt would keep growing on its own, fueled by penalties and compounding interest rates that doubled their debts every few years. By the time they came before a bankruptcy judge, they were so deep in debt that being flat broke – owning nothing, but free from debt – looked like a huge step up and worth deep personal embarrassment. I have never filed for bankruptcy. But it’s so easy to see how I could have ended up in that situation. I like that Elizabeth Warren sees that, too. She still wasn’t in politics, but she continued to teach bankruptcy law. I kept teaching bankruptcy, but the world outside my classroom was changing, too. The numbers of people going bankrupt kept climbing, in good times and bad. By 1990, more than seven hundred thousand families filed for bankruptcy in a single year – the number had more than doubled in the decade since I had started teaching. That shocked me…. At school, I heard from secretaries and cafeteria workers. I heard from other professors whose children or old friends were in trouble. Sometimes someone would stop me in the mailroom or while I was waiting in line for a sandwich. Most people didn’t ask for help. They just seemed to want me to know. I think they hoped to hear me say, “There are a lot of good people who end up bankrupt.” At least, that’s what I believed, so that’s what I always said. And then, in the early 1990s, the big banks began pushing for tougher bankruptcy laws. At this point, the book briefly explains the history behind the explosion of both bankruptcies and bank profits. With usury laws and the 1930s banking regulations as a backdrop, banks played a really important role in helping America’s economy grow. They lent the money for families to buy homes, and those monthly payments became a sort of giant savings plan, so that by the time people retired, they owned a valuable asset – and a place where they could live without paying rent. Over time, banks financed cars and college educations. They helped small businesses get a start. A handful of larger banks served the biggest corporate clients, giving them access to the money they needed to expand and create jobs. Banking was all about evaluating customers, making sure that they would be able to repay loans, and keeping interest rates competitive with the bank across the street. It all worked pretty well. Until the 1980s, that is. At that point, with scant notice and very little public discussion, a momentous event occurred: thanks to a Supreme Court ruling about a century-old banking law and an amendment quietly passed by Congress, the cap on interest rates was effectively eliminated. Suddenly, banking was changed forever. The usury ban for large American banks disappeared, and deregulation became the new watchword. The bigger banks were now unleashed, and they started loading up credit cards with fees and escalating interest rates – tactics that would have been illegal just a few years earlier. Once the banks began to figure out just how lucrative these cards could be, they started juicing their profits by lending money at super-high interest rates to people who were a lot less likely to repay all those loans. By the 1990s, they were targeting people who were barely hanging on – those with modest or erratic income, those who had lost their jobs and were scrambling. In other words, the banks were targeting people just like the folks who ended up in the bankruptcy courts…. Why would the big banks do this? Here was the trick: Even with the bankruptcy losses, the banks could make more money if they kept giving credit to people who were in trouble. Yes, the banks had to absorb bigger losses when people went bankrupt. But in the meantime, they could make a lot more money from all those people on the edge who didn’t file for bankruptcy protection, or at least didn’t file for another year or so. Interest rates and fees were so high that, in the end, the banks came out ahead – way ahead. Even with profits breaking records every year, the banks weren’t satisfied. They thought of more fees to tack on, more ways to escalate interest rates, and more aggressive ways to market their cards. Credit card vendors started showing up on college campuses, targeting kids with promises that there would be no credit checks and no need for their parents to sign. Children were preapproved. And occasionally even a dog would get his fifteen minutes of fame, when a local newspaper heard about some cute little pooch who had just been offered a credit card. To pump up their returns even more, the banks tried a new tactic: What if they could persuade the government to limit bankruptcy protections? Sure, a lot of families were broke, but maybe some of them could be pressed to pay just a little more. If they couldn’t file for bankruptcy, maybe more families would decide to move in with their in-laws, or borrow from their neighbors, or hock their wedding rings, or cancel their health insurance – who knows? If several hundred thousand families a year could be squeezed just a little harder, maybe the banks could add yet more profit to their bottom lines. If you knew anything about bankruptcy law – and by now I knew a lot – you could see exactly what the big banks were up to. I was just a law school professor, so I didn’t have the power to change anything, but the deep cynicism behind these new tactics infuriated me. For the banks, a change in the bankruptcy laws was just one more opportunity to try to boost profits. For the families – the moms, dads, kids, grandparents, aunts, uncles, and cousins – who would lose their last chance to recover from the financial blow of a layoff or a frightening medical diagnosis, the pain could never be measured. So that was what motivated Elizabeth Warren to step into politics. First, she was offered a position at Harvard, which she knew would enable her voice to be heard more clearly. Then she was asked to serve on the National Bankruptcy Review Commission. I told him no. I was deep in my research, and I thought the way I could make a difference was by writing books and doing more research about who was filing for bankruptcy and what had gone wrong in their lives. I didn’t know anything about Washington, but the bits I picked up from the press made it sound pretty awful. But her friend was persistent, and said if she’d join the commission, he would ask her to supply three good changes in the bankruptcy laws. And that’s what I thought about, all the way home. My office was stacked with piles of questionnaires from people in bankruptcy, and many of them told personal stories about what had gone wrong in their lives and described the sense of defeat that they carried to the bankruptcy court. I thought about the family that finally got a shot at their lifelong dream to launch a new restaurant – and it went belly-up. The young and very tired woman who described how she finally managed to leave her abusive ex-husband, but now she was alone with a pack of small children and a pile of bills. The elderly couple who had cashed out everything they owned and then went into debt to bail out their son and put him through rehab again and again. So she joined the commission, and joined what turned out to be a long drawn-out battle with the big banks and their lobbyists. And eventually, they lost the battle. On good days, I reminded myself that our fight to protect America’s middle class had held off the banking industry for nearly a decade. From the day President Clinton appointed Mike Synar to launch the National Bankruptcy Review Commission to the final passage of the bill, millions of families had gotten some relief from their debts. On bad days, I admitted that right from the beginning, the game was so rigged that working. families never had a fighting chance. The big banks would eventually win. They simply had too much power…. David really did get the slingshot shoved down his throat sideways. It hurt then, and it still hurts now. The bankruptcy wars changed me forever. Even before this grinding battle, I had begun to understand the terrible squeeze on the middle class. But it was this fight that showed me how badly the playing field was tilted and taught me that the squeeze wasn’t accidental. We had lost the bankruptcy battle, but this war wasn’t over. People were getting pounded, debts were mounting, and the squeeze was getting more intense than ever. Our oversight of the bailout wasn’t perfect, not by any stretch. But I saw what was possible. We took an obscure little panel that could have disappeared without a trace and worked hard to become the eyes and ears and voice for a lot of people who had been cut out of the system. And every now and again we landed a blow for the people who were getting pounded by the economic crash. That felt good. It felt really good. Next came the battle to establish a Consumer Protection Agency. She won this battle, though she made enough banking enemies that she could not be confirmed as its permanent director. But in the end, I think most of the credit for this win goes to the American people. Sometimes they were organized – through nonprofit groups and unions and coalitions. Sometimes they were a little disorganized, as single voices burst forth in funny videos and online blogs and old-fashioned letters to the editor. But organized or not, the people made themselves heard. In the chapter about getting the Consumer Protection Agency off the ground, she also speaks up for the dedicated government workers she encountered and the wonderful people who wanted to do their bit. America has faced difficult problems before – and we’ve solved them together. We passed laws to get children out of factories. We set up a system that allowed aging workers to retire with dignity. We built schools so that every child would have a chance for a better life, and we created a network of highway and mass transit systems so people could get to work. We built an astonishingly tough military, superb police forces, and squadrons of first-class professional firefighters. No, the market didn’t build those things: Americans built them. Working through our government, we built them together. And as a consequence, we are all better off. We can’t bury our heads in the sand and pretend that if “big government” disappears, so will society’s toughest problems. That’s just magical thinking – and it’s also dangerous thinking. Our problems are getting bigger by the day, and we need to develop some hardheaded, realistic responses. Instead of trying to starve government or drown it in the bathtub, we need to tackle our problems head-on, and that will require better government. After the Consumer Protection Agency was established, she was going to simply go back to teaching at Harvard. But people – ordinary people – asked her to run for the U.S. Senate, asked her to fight for them. This victory wasn’t mine. That’s not some kind of fake modesty talk – no, that statement is deep-down truth. This victory belonged to all the families who have been chipped away at, squeezed, and hammered. This time, they fought together and won. And now they were sending me to Washington to fight for them and for every hardworking family who just wants a fighting chance to live the American dream. I’ve quoted extensively from the book, but there’s a lot more if you actually read the book. Elizabeth Warren’s personality comes through, and I find myself just liking this woman. She’s smart, she’s done her research, and, bottom line, she cares about people and got into politics to serve.